The Goum was like an old west posse. It was quickly assembled in response to a raid or before setting out on an expedition of conquest. The Arab Bureau Officer would call upon Arab caids to furnish men. The willingness of the Arabs to cooperate depended on the personal and political relationship between the caid and the officer. The Goumiers were mounted on horses or camels. They could range for hundreds of miles, far beyond the capabilities of Europeans or gular native troops. However, the Goum had several disadvantages. It was not a force in being, so that by the time it was formed, the desert raiders often had a good head start. Naturally, they were undisciplined, inclined to pillage, and often reluctant combatants against their own people. The Goum was useful as an adjunct to columns of regular troops, as scouts, and skirmishers. As irregulars, they had no special uniform. They wore the normal dress of desert tribesmen. After the Flatters massacre in 1881 (see here), a Saharan Tirailleur Battalion and one company of Saharan Spahis were formed. 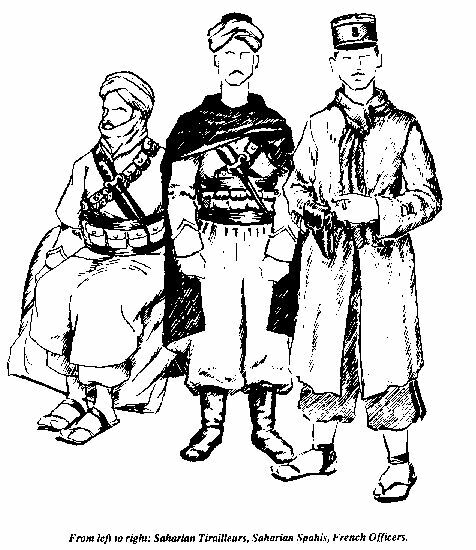 The Algerian troops hated duty in the southern oases, so the French began recruiting the Saharan Tirailleurs from the Black slaves of the oases. With training and discipline they became good soldiers. They were submissive, courageous and faithful. But the units were disappointing. Since their prior employment was mainly that of agricultural laborers, they had few skills as horsemen or cameleers. The cadre was very mediocre. Instead of supplying a cadre of picked volunteers, the Algerian Tirailleurs passed on their worst lieutenants and N.C.O.'s. The soldiers reflected the poor quality of their leaders. Finally, while they were useful as infantry to garrison oases and advanced posts, they were little defense against the mobile Arab raiders. Saharan Spahis (horsemen) were created to patrol the dunes beyond the oases. They were recruited from the nomadic Chaamba Arabs. Little training was needed, as they already knew how to ride and shoot. Unfortunately they suffered from many of the same problems which afflicted the Tirailleurs. It was said "The better class of the population never volunteer for military service." The French forces were not quite as effective as the Tauregs they were fighting. In 1901 the French began to shift the emphasis from Spahis and infantry to camel mounted troops, who could move rapidly and fight as infantry. The Saharians were reorganized. Three "new" companies of Saharians were created for the Gourara, the Tuat, and the Tidikelt, each with 300 natives and 42 Frenchmen, 6 of whom were officers. 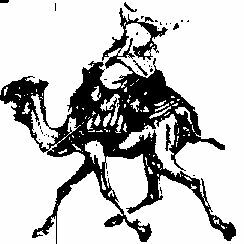 Most were infantry, but 70 of the natives were camel mounted, called the faction mobile. In order to correct some of the earlier problems, Laperrine sought to retain the mobility of the Chaamba goums, but at the same time stiffen their discipline with hand picked French Officers and N.C.O.'s. Saharan Tirailleurs: Red fez with green tassel, wrapped in a white turban. White jacket with pointed cuffs piped yellow. Wide red waist sash. Baggy khaki pants. Reddish-brown sandals and belts (one waist pouch belt, one pouch belt over the left shoulder, and a plain belt over the right one. The bayonet hangs from the chest.) tunic like a jibba. Saharan Spahis: In the field they often wore a khaki Same as Tirailleurs but wore boots and a blue-black hooded cape. Presumably they were armed with a scimitar and carbine. Saharan Camelry: Camel riders of the faction mobile often wore part of their turban draped around their neck and under their chin. Officers: Sky blue kepi with gold bands around top and bottom, with a gold crescent and star insignia on front. Madder red tunic with gold buttons and collar insignias. Sky blue trousers with double stripes of madder red. Brown belt and holster. In the field they often wore sandals and a white duster or overcoat and a khaki scarf. Goums could be used in any game where you need some scouts and have some extra Arab horse figures. They should have low morale and hand to hand abilities. The Saharians were not headline winners nor are they tops on anybody's army list, but a platoon each of Tirailleurs, Camelry and Spahis would make an interesting addition to those Legionnaires. A mounted column composed of Saharians, Legion Mule Co.s, Spahis and Chasseurs would make a nice relief force for a beleaguered garrison. For skirmish games, a group of Saharians and Goums in pursuit of Arab camel raiders would make an interesting scenario. Any Turco or Spahi figure could be used. To represent camel troops in cloaks, Lizard Grin's so called Dervish camel rider and rifleman would make conversion easy. Porch, Douglas. The Conquest of the Sahara. New York: Alfred A. Knopf, 1984. Funcken, Fred and Lillian. ,1975. Arms and Uniforms of the Second World War. Part 1 . London: Ward Lock Ltd., 1975.